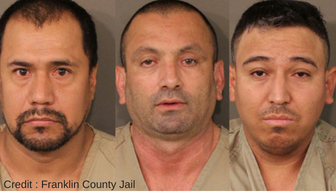 A large scale investigation of a drug trafficking organization led to the arrest of 4 men in possession of enough fentanyl to kill half the population of Ohio. 22 pounds of fentanyl were seized, along with 2.2 pounds of meth and 10 ounces of heroin at a home in South Napoleon Ave in Columbus, Ohio. Tomas Sandoval, Alvaro Gasca-Cardoso, Salatiel Ramos-Rajos and Alexis Zazueta-Soto are charged with conspiracy to possess with intent to distribute fentanyl, methamphetamine and heroin. A report from state Auditor David Yost found the number of Ohio Medicaid recipients with an opioid-related diagnosis grew 430 percent over seven years — climbing from 6,500 in 2010 to nearly 48,000 in 2016. More than 90% of the drugs analyzed at the Hamilton County crime lab through May 3rd of this year have had the synthetic opiate tested positive. And according to the DEA, two milligrams can be a lethal dose of fentanyl. The amount of fentanyl seized could amount to 5 million fatal doses. The influx of fentanyl across the country has led law enforcement and health officials to believe it can be found in most every dose of street heroin and even in some counterfeit pills that have been known to be especially lethal. In Columbus, health officials have made plans to distribute 1,000 test strips to drug users to help them determine whether drugs are laced with the powerful opioid. This bust may have saved millions of lives in Ohio, in a state already hard hit by overdose deaths, ranking it #2 in the entire country. Dayton, Cincinnati and Toledo were on the top ten list of cities with the highest number of overdoses in the nation. Montgomery County, home to Dayton, was documented through an NBC series, claiming it was the “most opioid addicted county” in the nation.